The Camino de Santiago (known as the Way of St. James in English ) is a medieval pilgrimage route that has been travelled by pilgrims for more than 1200 years. The Camino terminates at the Cathedral of Santiago de Compostela located in Santiago, Spain. The remains of St. James the Greater, one of the twelve apostles, are believed to be interred within the cathedral. The story of why his remains are interred in Spain is very interesting. While Jesus Christ was here on Earth, one of the first steps He took as he began His active ministry was to assemble a group of 12 men, who we know as the Apostles. One of these men was James, son of Zebedee, also known as James, the Greater (not to be confused with James, the Just, the brother of Jesus and the head of the early church in Jerusalem). James was one of the first apostles to be called by Jesus and the first apostle to be martyred for his faith. One of the last instructions Jesus gave to the apostles before His ascension is known as the “Great Commission,” in which He commanded the Apostles to go and “make disciples of all nations” (Matt. 28:19). Tradition holds that many of the apostles did just that. In particular, St. James is believed to have travelled throughout Iberia (Spain) preaching the Gospel. However, shortly after returning to Jerusalem in 44 A.D., he was beheaded by Herod Agrippa. His followers are believed to have taken his bodily remains back to Spain where they were buried in an ancient Roman cemetery in Northwest Spain. They remained undisturbed until a peasant, named Pelayu, rediscovered the crypt in 813 A.D. The local bishop confirmed that the crypt contained the remains of St. James (Santiago, in Spanish) and a small church was erected over the site in honor of the apostle. Over the centuries the church was improved and expanded until eventually it was replaced with the grand cathedral of Santiago de Compostela which we can visit today. In a crypt located below the main altar you can view the beautiful silver casket containing St. James’ remains. Almost immediately after the original discovery of the crypt, pilgrims began travelling to the site (now known as Santiago de Compostela) to pay their respects to the Apostle who had played such an important role in spreading the news of Christianity to the pagans living in the Iberian Peninsula. Over time, Santiago de Compostela would become one of the three most important pilgrimage destinations in the Christian world, along with Rome and Jerusalem. The tradition continues into the modern era with hundreds of thousands of pilgrims arriving in Santiago every year. According to the official Pilgrim Office of the Cathedral of Santiago, the number of pilgrims arriving in 2016 totaled 277,854! There is no single route which can be called the Camino de Santiago. In reality, the “Camino” is comprised of an extensive network of recognized routes all of which converge at the cathedral in Santiago. (See map below.) The most commonly travelled route is called the Camino Frances. 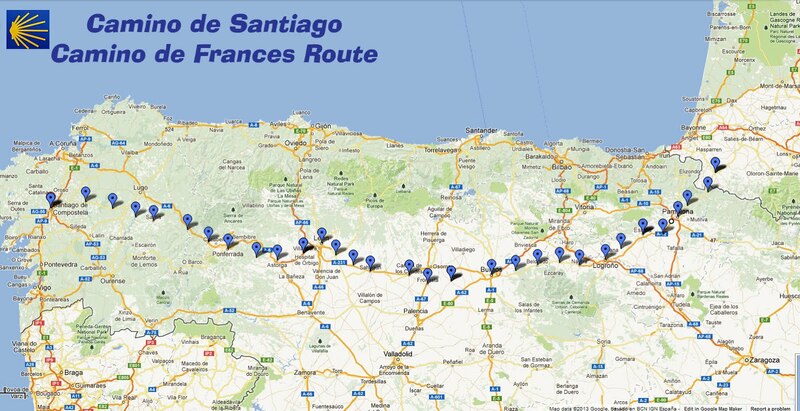 This route stretches for 490 miles (775 km) from the town of St. Jean Pied de Port, located in the southwest corner of France, across the Pyrenees Mountains and the top of Spain, to Santiago. Other routes originate in from cities throughout Europe, including one starting in Le Puy en Velay (the Via Podiensis) which I will be hiking later this summer. In 1987 the Camino de Santiago was designated as the first European Cultural Itinerary and in 1993 it was designated a UNESCO World Heritage Site.